Leaving home was more difficult for some young men than it was for others. Alfred E. (Irv) Nelson worked at CCC Camp Rabideau near Blackduck from April 1936 until June 1938. In an interview conducted in April 1976, Mr. Nelson remembered his first days in camp. Well, I was a pretty scared kid. I was probably seventeen years old, and this was something new to me. I had never really been away from home before for any time at all, and I guess we were all in the same boat. I think there were about 80 of us that came in there at the same time. Then we went through a series of changes - everything was under the army regulations which was something different for us and we had to go through a series of shots; it seems they gave us shots for everything and I think it was always a square needle. Then we got our clothing issued which was worse yet; nothing fit on the first issue of clothing. It was two sizes either too big or too small. 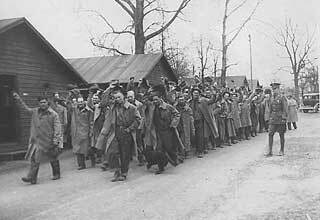 Civilian Conservation Corps members leaving Fort Snelling for the Superior National Forest, 1933. 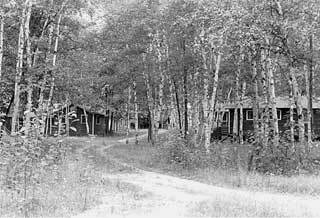 General view of Rabideau CCC camp, Chippewa National Forest, Beltrami County, 1974. Nelson, Alfred, E. (Irv); Stan Johnson, Interviewer. Oral History Interview. MHS Oral History Collection, 1976.